A six slice toaster oven with easy to read dial & cool to the touch exterior that is an extra safety bonus. 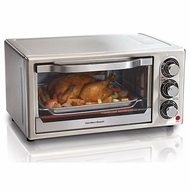 This stylish toaster oven is sure to be a great addition to your kitchen for years to come. Toaster oven is easy to clean with a damp cloth.